How can we talk about anything before addressing the ending. I don't want to read the next book. In Harry Potter, we never had to live with the aftermath of the deaths in The Deathly Hallows. If we did, we would have hated it. I don't want to imagine reading about the Weasleys after Fred. There's no coming back from that. All the dynamics we know and love change. I DON'T WANT TO EXPERIENCE THE BLACKTHORNS AFTER LOSING LIVVY. Things like that wreck families. I don't want Cassie Clare to try to insert the usual banter or even just normal behavior into Queen of Air and Darkness. It's not possible or right- the Blackthorns will never be the same, and as fans we have to understand they may not be the same people we know and love. ARE YOU READY FOR THAT? And Robert... how much more can the Lightwoods take? And the Clave... he was the right person to lead them to a better future of positive change. He even embodied that change in his own life. And after Tales of a Shadowhunter Academy I just can't... basically sobbing. But enough of that (I write with tears in my eyes). There are 699 other pages to discuss. Mark-Kieran-Christina. I, unlike everyone else apparently, hate this. I believe in marriage, partners. I love the love between all of them, but this can't work IRL. I feel like CC is trying to recreate Will-Jem-Tessa and I do NOT want more convenient life extensions. Unfortunately I can't remember if Diego was still in the running for Christina or not. Hope not though. About Kieran- I LOVE HIM. I love how he balances himself, becomes more moderate in personality, temperament. I loved how Mark went to save him, how they love each other even as they struggle to understand their relationship in the real world. Dru and Jaime - anyone else completely flummoxed but also charmed by this? At first I was super worried - there is a power imbalance. Dru is young and easy to be taken advantage of by older, cool Jaime who is the first one to treat her like an adult and also asks her to keep a secret. However I was pleasantly surprised that things didn't go down that road and in general I love Dru and can't wait to hear more from her POV in future books. Ty-Kit-Livvy. I love them, I want the best for them. The boys are absolutely the best thing that could happen for each other. My only complaint is that is was very obvious this was gonna happen last book- personally I dig subtlety. Which brings me to Diana- her story was amazing and full of heart and pain and it's kinda cool that the internet figured that out but I wish it wasn't spoiled for me. Magnus - ALL THE FEELS. I love him, I love what he brings to the stories. I can't get over what happened- if Magnus had been there LIVES COULD HAVE BEEN SAVED. Julian and Emma - I was so happy when they were in the cottage. Characters in the Shadowhunter world deserve more happy times. I don't know what to think about Julian... I feel like the writer is forcing this darkness upon him. He hates himself for the things he needs to do sometimes, and yes, he shouldn't think dichotomically- NO JULIAN, THE CHOICES AREN'T ALWAYS THE WORLD OR YOUR FAMILY. However, sometimes it is and I don't think it's fair to judge him in positions like that. As I'm sure you've realized, for me Shadowhunter books are all about the people, the dynamics, the relationships. 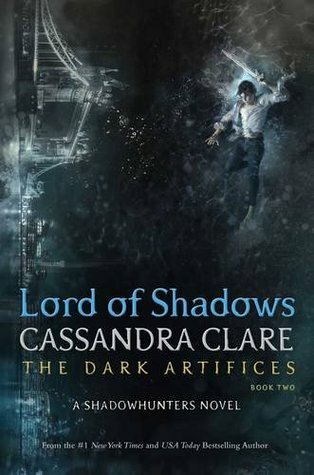 But in Lord of Shadows CC really hit the ball out of the park with a metaphor for real-life war, politics, bad choices and mistakes. As always, a beautiful and very flawed installment.